Welcome Plymouth School of Music’s new teacher! We have a lot of exciting changes that are taking place here at Plymouth School of Music! This column will be reserved every month to help keep you in the know!.. Parking Situation Resolved: lately there have been a few challenges in regards to parking at the studio. The lessons house is rented on occasion to church and other groups for their evening meetings. What’s more, we also share our parking lot with the Plymouth Arts Council that uses their facility for other activities. We understand that it is difficult to find a parking spot and we have a solution: Reserved parking spots! These spots will be marked with cones. Please feel free to park in the reserved spots! Your studio newsletters as the one-stop new information source: We are happy to see and hear that every student looks forward to reading our school newsletter. The newsletter comes to you EVERY month and in two formats: Email and hardcopy; mailed directly to your house and inbox! In efforts to cut down on unnecessary paper usage (separate handouts and mailings of studio updates) We will be using the studio newsletter as your one-stop-source of studio news; including important updates such as policy changes. As a reminder, you may check online for available spots for makeup lessons. We have improved the process by splitting the process up into two parts: a cancellation form and a makeup lessons form. Don’t lose your lesson time! Starting the month of may we will be offering advanced makeup classes on an additional day to be offered May through August. In the past years Plymouth School of Music has always grown significantly during the summer months both in June and in August (by as much as 50%). Students in the past that have decided to withdraw from lessons for the summer have returned to find the valuable lesson time has been filled by a new student; all because they had a vacation planned. Don’t let this happen to you! It’s always a heartbreaker to have to tell a returning student in the fall that we have to put them on a waiting list or that they might not get a convenient lesson time. Get your makeup lessons in advance AND keep your valuable lessons by signing up for your makeup lessons before summer arrives! What you made decide to learn the Guitar? I was inspired by Taylor Swift. I like her music and how nice of a person she is! What is the coolest thing that you have been learning in your lessons? I have learned a lot about chords, strumming and how to sit an play and make my fingers work like a pro! I used to have a dog but now I have two fishes. Their names are Shimmer and Taylor. They are both goldfish, one is white with a red stripe on its tail and the other is orange with gold tie dye colors on its tail. I really like arts and crafts. I like swimming and singing too! are our greatest resource for new students at the school! 30% off one month's tuition! There is no limit to the number of people you are allowed to refer and It is very easy to do. All you have to do is just fill out your friends contact information below. Fill out as much as you know for as many people as you can, fill out the form on the website and we will contact them. If they sign up for lessons, you will get 30% off your next month's OR $30.00 cash! Anya recently completed her Bachelor of Music in Vocal Performance with a pedagogy specialization at Bowling Green State University. She has been in opera productions throughout the mid-west since 2009. Credits include La Bohème with Toledo Opera, Le nozze di Figaro with Bowling Green Opera, as well as Gilbert and Sullivan productions twice a year, for the last 5 years. She has premiered several works from emerging composers including the lead role in Lucas Marshall Smith’s musical On the Way to Me. She has sung with orchestras and conductors from all over the world. Anya’s passion, though, is pedagogy - the teaching of singing. Studying under great pedagogues from around the world, teachers include Monica Swartout-Bebow, Jane Schoonmaker-Rodgers, Jennifer Goode-Cooper, Ken Donnovan, Freda Herseth, and Rosa Baldursdottir. She has started a teaching career spanning many genres of music. She loves teaching students in their style of learning, so that music can be accessible to everyone. She has worked with kids all her life as a babysitter and nanny. Anya began her teaching career at Temple Beth Emeth in Ann Arbor as an assistant for Hebrew and Religious School, later leading the religious school music curriculum for Pre-K through 5th grade students. Anya currently conducts the Stony Creek United Methodist Church choir. She is looking forward to begin working at the Plymouth School of Music and can’t wait to meet everyone! As a practicing musician for over 30 years, I can honestly say that there have been times where I’ve been tempted to quit taking lessons for various reasons. Conflicting activities, life changes and even something as simple as a nice weather have tempted me to give up on my music lessons; but I NEVER gave up!..I made adjustments and kept going with my learning! We would like to take the time to acknowledge as long-time students: Those who have been studying at the studio for over a year! Thank You for reading..stay tuned for next month's newsletter! PSoM’s Website has a new look! Plymouth School of Music’s Website has a NEW look! We encourage you to visit and take a quick tour of our slick and swanky new look. The school director (Jeff Davis) is the creator of the new look. While creating it he had one thing in mind-YOU the student. Mr. Davis spent hours talking with parents, students and prospective students alike-people who use the website the most– to find out what they were looking for, and what the most important tools they felt most important. Overall, the menus and navigation have been simplified particularly with lessons related communications. One addition that has been a huge improvement is a LIVE chat feature where questions can be asked by new and current students alike. What’s more, a mobile version of the site has been added to make viewing and accessibility much easier. Other components have been added such as a “Recital Sign up” page. Students will now be able to see sign up at their convenience online and see the program one week in advance of the performance!..Go online and check it out today! What made decide to learn the Guitar? I have always like the sound of the Guitar. I always thought that it would be and interesting and fun thing to play. I figured that it would keep me challenged. I have a Dog named Cali. She is a cockapoo. I really like watermelon A LOT! Evan has been studying the guitar at PSoM for almost a year. He has been learning quite rapidly and has performed in the studio recital last December. Stay tuned for her performance video which will be posted on YouTube in the next few months! Let’s welcome the following NEW students to Plymouth School of Music! 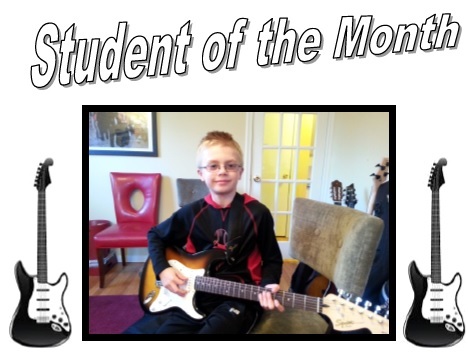 As you know, at Plymouth School of Music, we always feature a student of the month in every newsletter. 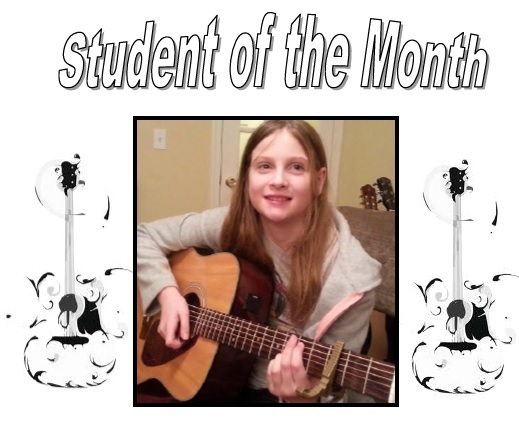 In this month’s newsletter we’d like to continue featuring “long time students of the month”. It’s inspiring to check in on those who have been studying for a while and hear about their musical journey. In this month’s newsletter we’d like to feature two brothers that have been studying guitar for over 3 years! Who is your teacher and how long have you been studying with them? 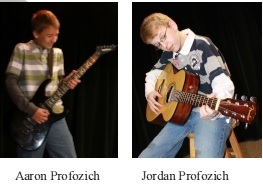 Aaron and Jordan: 3 years ago Mr. Davis came to our school and did a demonstration on the guitar and it was really cool. We decided to sign up for lessons right away!. How much time do you spend practicing each day? Jordan: 20 to 30 minutes everyday. I spend the most time on notereading. I have made it through 3 hal leonard guitar method books. Do you have any advice for students that are have a difficult time keeping up with their practicing? Aaron: Listen to your teacher when he or she says to practice! He knows what he’s talking about. Jordan: Stick with it and it takes dedication. I used to have a really hard time with rhythm reading but I just kept working on it and eventually with my teachers help, I got it down! Jordan: I am learning the Entertainer adapted for the Guitar with standard notation not tablature. Plymouth School of Music would like say “Happy Birthday” to the following current and former students who’s birthdays fall in the month of April! Copyright (C) 2014 Davis Gutiar Studio All rights reserved. · Makeup Lesson Policy Updates! TOP 10 Reasons why everyone should learn to play a Musical Instrument! Can you imagine living your life without music? It would be very hard to do so. While everyone enjoys listening to music, not many of us bother to learn to play! This could be for a few reasons. First, some people may lack the incentive to learn or second, they may feel that they are simply “not talented enough” to give it a try. In my 26 years of teaching I can tell you first hand that anyone can learn to play a musical instrument! Too often many of us suffer from self doubt and self defeating thoughts that keep us from even trying it out. Even as a full time teacher and director at the studio, I still spend time to keep up with my learning on the guitar. I feel that everyone can benefit from learning to play and that everyone should take the time out to learn to play at some time in their lives..Listed below are the top ten reasons why I feel learning to play an instrument is important. a musical instrument do better in academics. Shaw, Rauscher, Levine, Wright, Dennis and Newcomb, in their research paper titled Music Training Causes Long-Term Enhancement Of Preschool Children's Spatial-Temporal Reasoning, speak about, “a research team exploring the link between music and intelligence reported that music training is far superior to computer instruction in dramatically enhancing children's abstract reasoning skills, the skills necessary for learning math and science." 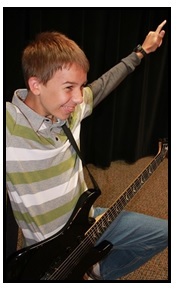 Choosing to take music lessons can help build confidence. Once you are aware that you are able to do something well, like play the flute for instance, you naturally become more confident of your skills. Learning to play an instrument can help both children and adults who face confidence issues. Elizabeth Dotson-Westphalen, a music teacher and performer, has found that music has helped many of students develop confidence. "They find that once they can develop a skill by themselves that they can get better and better." Stuck in everyday routine lives, many of us lose touch with our creative side. Learning to play a musical instrument, especially when you reach advanced levels, can foster that lost creativity. Since music education plays on your mental, emotional and cognitive abilities, the brain is stimulated to think out of the ordinary, which results in improved creativity. ~ Stay tuned! Why did decide to learn to play the Piano? I am inspired by the music that I hear on the radio. I would really enjoy learning to play some of the popular music that I hear. What have you been learning in your lessons? I have been learning how to read music and have been enjoying learning to play “jingle Bells”. Plymouth School of Music for a few months and has been making great progress! 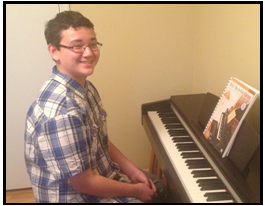 We look forward to hearing Isaiah Perform at the next studio recital on May 17th, 2014. 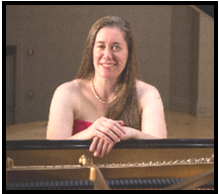 Plymouth School of Music Piano teacher Sarah Hamilton is finishing up her Masters Degree in Piano at Eastern Michigan University. As part of her degree requirements Sarah will be playing a solo recital on March 14th, 2014. The recital is free and open to the public and will be followed by a short reception. Italian Concerto by J.S.Bach, Piano Sonata Op 13 by Beethoven, Preludes by Chopin, and Waltz by Shostakovich. WHERE: Pease Auditorium on the campus of EMU. 1. The online form is the ONLY method of cancelling and scheduling a makeup. Incorrectly filled out forms may void your makeup lesson. 2. You must cancel (fill out the absence online absence form) 24 hours in advance to receive a makeup lesson. 3. There are No makeup’s for missed makeup lessons. The makeup lesson system is NOT to be used as a weekly lesson reschedule. It’s important that you keep your normal weekly scheduled lesson time and ONLY use the makeup system for in-advanced upcoming absences that are unavoidable; vacations, sports conflicts etc. If we see that see that students are using this system in a way to continually reschedule their lesson from week to week; you will be asked to permanently switch your lesson time. can’t always promise you a makeup. The makeup calendar is based on teacher availability. Our teachers are very busy professional musicians. They’ve made it a part of their schedule to meet with you once a week at your originally agreed on time. From time to time they do however have spaces in their schedule that allows for a makeup lesson; this is what you are seeing when you view the makeup calendar. There will be weeks where you will see N/A on their schedule. This is because they are completely booked up. You may have to wait it out until you see something come available. The makeup lessons availability is “first come first serve” know that other students are viewing this continually to check the availability for their makeup lesson as well. Please note: If or any reason the teacher cancels your normally weekly scheduled lesson a substitute teacher will be provided for you. Please know that we work hard to find quality substitute teachers for these absences. Please do not cancel your lesson when you know that a substitute teacher is coming in. They are qualified to teach and are just as capable of teaching as your regular teacher. In the case of school closings (snow days, power outages etc) you will be given a makeup lesson. In these rare cases your teacher will open up other lesson times for a makeup lesson for you making things easier for your schedule. · PSoM School calendar: Spring Recital date posted! · Teacher availability: is your teacher SOLD OUT? 1. Playing an instrument relieves stress: Researchers studying the benefits of studying a musical instrument have shown that practicing and playing an instrument calms the mind and makes us feel relaxed. 2. Playing a musical instrument improves your social life: Music helps you connect. Learning an instrument enlarges your social circle since you get to meet more people than you usually would. In children, music can help develop social skills. Maestro Eduardo Marturet, a conductor, composer and musical director for the Miami Symphony Orchestra, who also oversees the MISO Young Artist program in South Florida, has observed the effect that music has on a child’s social skills. "Socially, children who become involved in a musical group or ensemble learn important life skills, such as how to relate to others, how to work as a team and appreciate the rewards that come from working together, and the development of leadership skills and discipline." -Stay tuned for part two next month! Why did decide to learn to play the Guitar? I was always interested in the guitar. My teacher Jeff Davis was teaching a guitar camp last summer and I took his class. 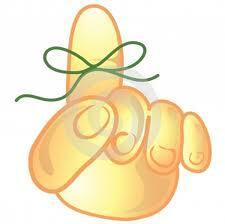 I learned very quickly in his class and decided to start private lessons with him to learn even more. I have been learning how to play the acoustic guitar. Jeff has been teaching me about strumming patterns and how to play popular songs by Taylor Swift. My biggest hobby HAS to be the Guitar, but I also enjoy art and drawing as well. Do you have any pets, what are their names? I have a dog and 2 cats. Their names are Jasmine, Shadow and Tyler. Ashley has been studying the guitar at PSoM since last August. She has been learning quite rapidly and has performed in the studio recital last December. Stay tuned for her performance video which will be posted on YouTube within the month of February. At this time of year many of you have been thinking of signing up, or getting more friends and family to sign up for lessons. If you are going to do so, please do this ASAP before your teacher is all booked up! Once your teacher is sold out we can add you to a waiting list. To further inquire about lesson openings at the school, email us at plymouthschoolofmusic@gmail.com OR call us directly at: 734.262.1409. It’s a brand new year and the PERFECT time to get started in new projects, lessons, activities and hobbies. At PSoM of course, we are thrilled to welcome the new students and families to our school and help them get started with the wonderful music lessons that we offer. When beginning new activities such as music lessons, everything is no new and exciting. Here at PSoM– there is an enthusiastic new teacher to meet, new books and perhaps a new instrument that you received for Christmas? And of course the new experience of learning to play. At PSoM, our instructors are well equipped with a variety of methods to keep every lesson exciting and new as possible. Our teachers have years of playing and teaching experience and also incorporate technology in their lesson studios. So, what else could possibly be needed then for new students (or even existing students) to remain interested in their lessons? We live in one of the robust times in history of the world as far as live music is concerned. It’s of the utmost importance that as a new and interested students of music, that you seek out as many local live performances and start attending them! Such local music venues as Kerry Town Concert house in Ann Arbor Mi. OR The Ark, also in Ann Arbor are great places to see live music on an intimate level (less than 100 seat settings). True we all have Ipod’s loaded with gigabytes of music, but nothing replaces live music and certainly there is more to live music to experience than what exists even in our practice rooms. We all lead such busy lives today that more and more we don’t take the time outside of the car or home to just sit down and listen to music and really experience it as it was intended. Students of all ages need to be exposed to many different styles of music to learn what about learn about all of the music in their world. What’s more, students need to know who the important people in music history really are; Especially in regards to particular instruments that they are studying. Many times, the initial training exercises necessary for learning a new instrument can be tedious. By listening to examples of WHY they are so important, students get a preview of the end result to come. Ask your teacher for a recommended listening every week in regards to the instrument that you are studying! Of course there are many more things that you can do, but these two recommendations should allow you to transition well into fostering a long term appreciation and love for music that will last for many years to come! ~Jeff Davis Happy New Year!